Reputation SESA is largely seen as a benevolent aid-focused government agency. Its agents are helpful and willing to go out of their way to look into and protect SLC-Expressive people. 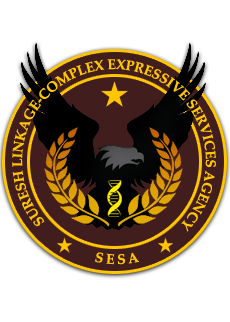 The SLC-Expressive Services Agency (SESA) is a newly-formed government oversight and activities agency founded after the shuttering of the Department of Evolved Affairs. SESA's goal is to maintain the well-being of SLC-Expressive American citizens, foreign SLC-Expressive refugees or those traveling to the US on Visa, and SLC-Expressive refugees seeking political asylum from foreign nations. SESA was founded following the ratification of the Chesterfield Act, which supplanted the Linderman Act and led to the removal of the extant Registry of the Evolved. Under the Chesterfield Act, SESA oversees all affairs directly impacting the lives and livelihood of SLC-Expressive humans. The agency handles accusations of business misconduct, criminal investigations, and other interdepartmental jurisdiction matters whenever they pertain to SLC-Expressive humans. As such, SESA employees are expected to work hand-in-hand with numerous government agencies on a daily basis. SESA has tens of thousands of employees nationwide in numerous types of roles from administrative all the way down to clerical. A SESA Agent's role is a diplomatic liaison to SLC-Expressive citizens and communities. They are part government envoy and part field agent. SESA agents report on violations of SLC-Expressive rights, assist communities in finding financial or material aid, and when necessary defend these communities' interests. A SESA agent has the authority to act as a law enforcement liaison in SLC-involved crimes or criminal activity and may oversee or review any federal, state, or local action that impacts SLC-Expressive individuals on American soil. In this role, they can ride along with law enforcement, investigate crimes, and otherwise get nose-deep in government affairs and have good reasons to interact with non-government individuals. SESA field agents are paired with another agent when given assignments, but not given career-length partners. These pairings are always an SLC-Expressive SESA agent partnered with a Non-Expressive SESA to provide impartiality and perspective to investigations. SESA field agents answer to Deputy Director Kristopher Voss. Consulting agents are outside contractors with government or related experience working with close observation with SESA under their jurisdiction.